A leading astronomer from Northern Ireland has called into question the potential discovery of a planet similar to earth. NASA claims to have found the first planet beyond our solar system that could sustain water on its surface. It is 600 light years away, twice the size of earth and called Kepler-22b. But Don Pollacco, from Queen's University, said NASA was hoping to "generate publicity" for its space programme. NASA's Kepler mission has already discovered more than 1,000 possible planets and that is part of the reason why Professor Pollacco is so sceptical of this latest announcement. "The only real difference with this one is that it's around a star similar to the sun," he told Radio Ulster. 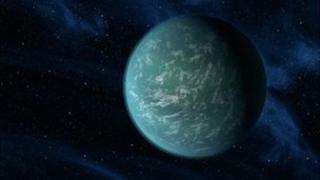 "There have been several planets already discovered where water could exist on their surface. "It's my job to be sceptical and to look at the evidence and right now there's very little evidence." While NASA has called the discovery a "major milestone" and suggested it is the closest it has come to finding earth's "twin", Prof Pollacco questioned the timing of the announcement. "You are asking a $200m question because that's the cost to continue this space mission," he said. "This space mission is nearing the end of its life and to continue it will cost that much money. "There are very good, important results that have come from this space mission. This, I don't believe, is probably one of them, so they have their own reasons. "There is a conference going on, they want to generate some publicity - that's why you are hearing this now."